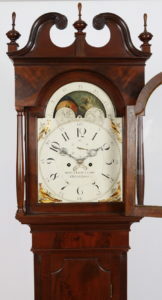 The Clark family were among the most active and celebrated craftsmen in Philadelphia during the late 18th and early 19th C. They were trained by John Wood Jr. and Ephraim Clark was at work as early as 1780 and continued Wood’s business in the shop at the corner of Front and Market St. Benjamin Clark was the brother of Ephraim Clark and was an active clockmaker, watchmaker, and silversmith at work in the City from 1791 to 1848. The shop moved venues over the course of time with locations on Market, Front, and High Streets in the City. 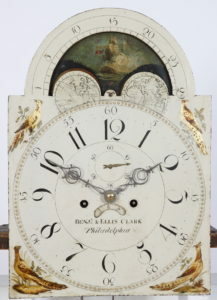 He was in partnership with his other brother Ellis Clark and they are listed in McElroy’s Directory. 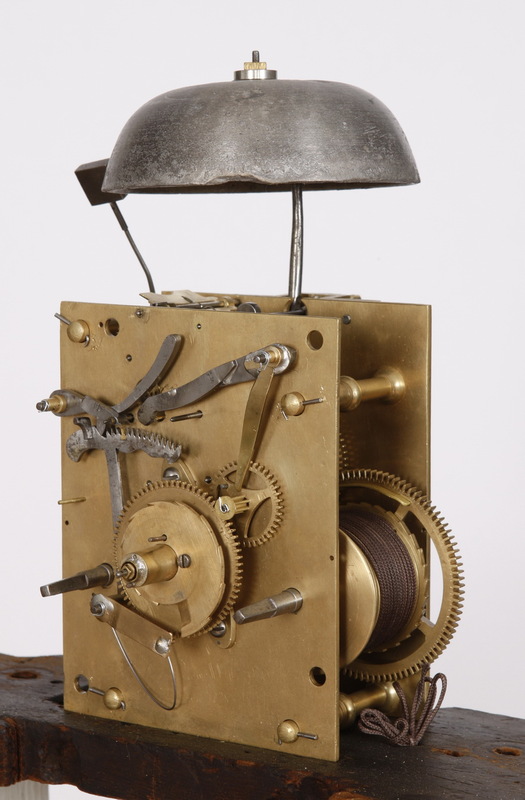 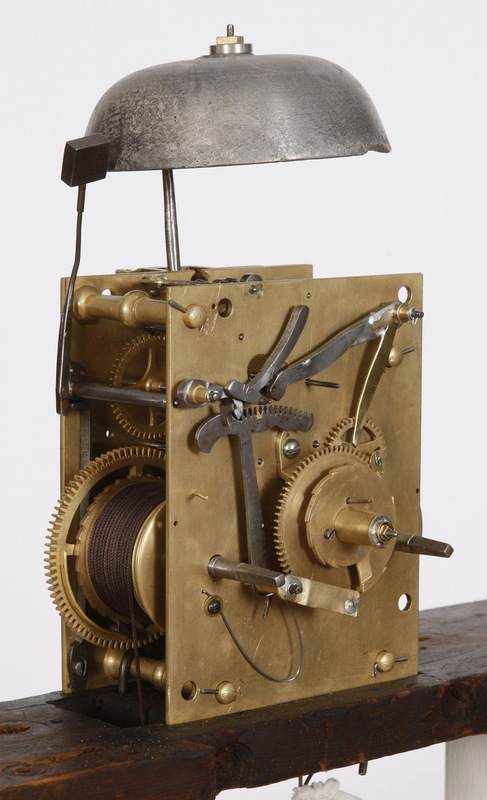 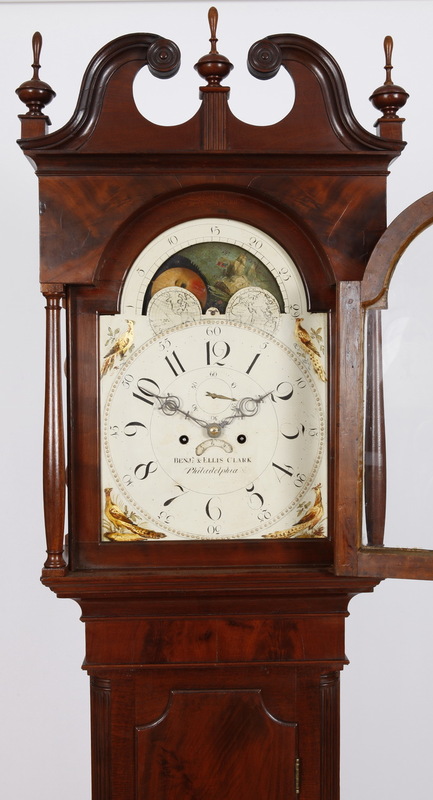 Ellis trained his son Ellis Jr. in the trade and Ellis Jr. advertised in the City Directories from 1842 – 1847 as a watch & clockmaker. In total, there were 13 members of the Clark family that were watch & clockmakers working in Philadelphia during the late 1700’s – mid 1800’s. 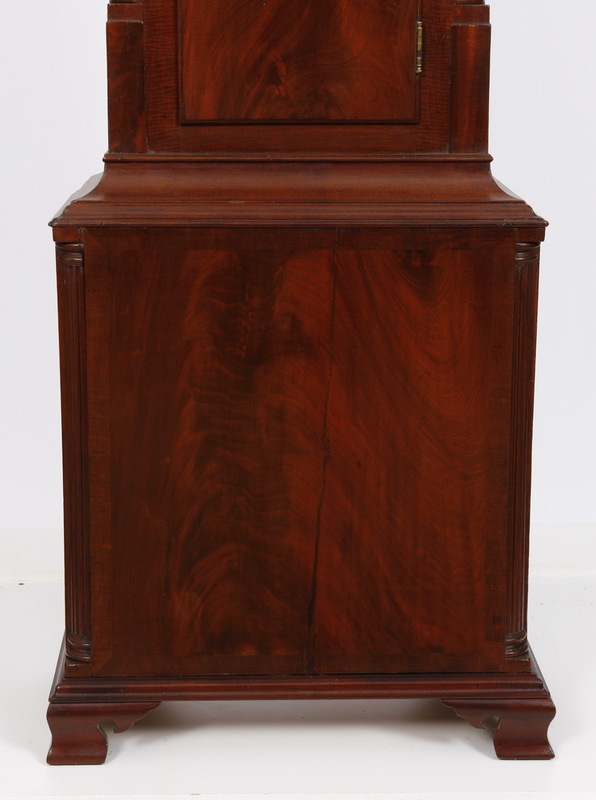 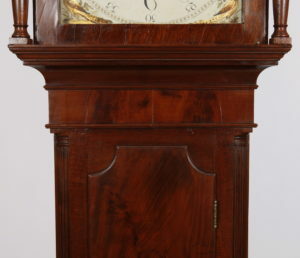 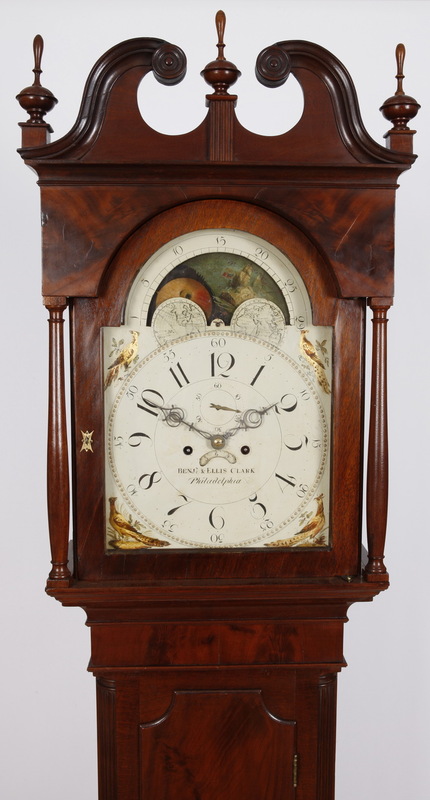 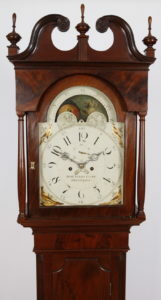 The example depicted in these photos is a C. 1800 transitional Chippendale Mahogany tall case clock with fluted quarter columns in the waist and base, ogee bracket feet and applied scrolls over a crown molding in the bonnet. The case exhibits the classic design of the Delaware valley with rectilinear proportions and a waist door with cut corners at the top. 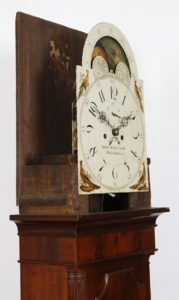 While the feet are appropriate bench made restorations, it is amazing that the original finials survived (wrapped in an old newspaper in the bottom of the clock). 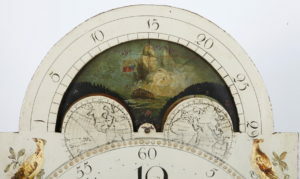 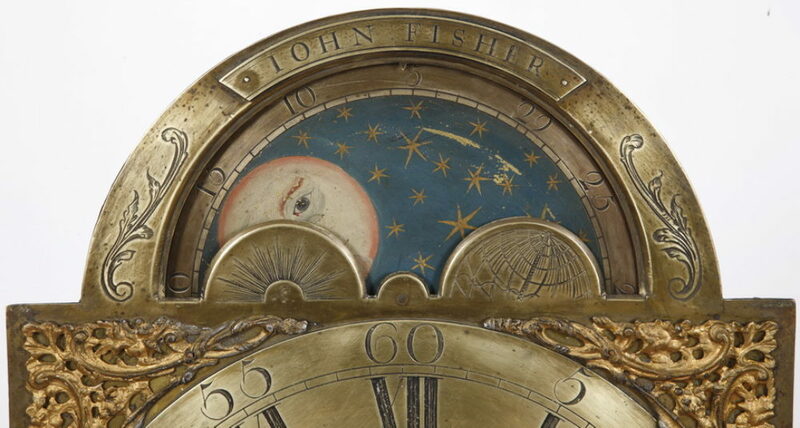 The painted iron dial mounts to the brass striking movement through an unmarked false plate and based upon the gilt bead and gesso decoration and the American flag flying on the ship in one of the moon scenes it is likely from the shop of Patton & Jones. 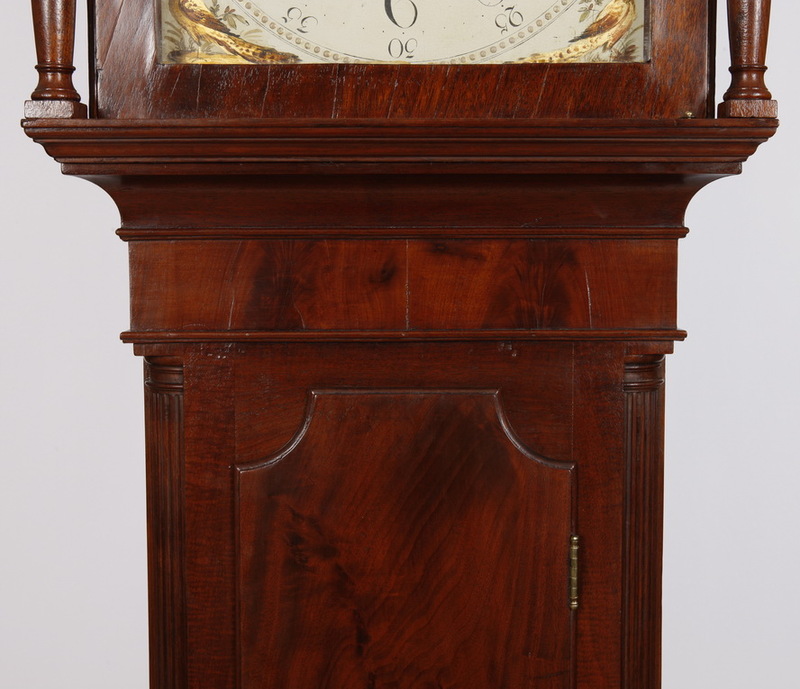 Overall the clock stands at 95″ tall and is 20 inches wide and 10 inches deep.